This picturesque scene of rural Surrey at the beginning of the twentieth century is only slightly different from the view today. The road is a little wider, and tarmacadamed, but the bend to the right is still as sharp. These days a hedge provides privacy for the Bargate stone cottages on the right, now one house, and the farm building immediately behind the horses and cart has gone. However, it looks as if what is now a boundary wall was part of this building. Hurtmore Farm itself, which is mostly 16th century and 17th century, is now a Grade II listed building. "Lot 1. Hurtmore Farm House and Buildings, with 21 acres of land ; one of the picturesque old Surrey farmhouses, with old oak staircase to first floor, and with walled kitchen garden and orchard adjoining the house ; capable of being converted, as a very moderate cost, into a very charming residence". Not long after the picture was taken, in 1913, the farmer of Upper Eashing and Hurtmore Farm was Edgar Sparkes Peachey, who lived at Eashing Farm. 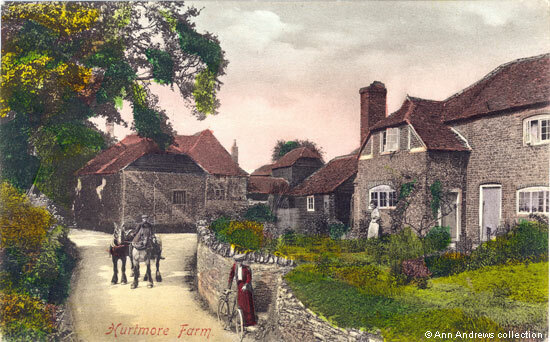 "Hurtmore Farm, Godalming", published by F. Frith & Co. Ltd., Reigate, No. 57607. First published in 1907. This card posted 22 Apr 1909 in Eashing and sent to Miss Day in Wendover. Personal message only. "The Morning Post", May 24, 1895. "Messrs. Horne, Son, and Eversfield are instructed to sell, by auction, on Wednesday June 26, at the King's Arms Hotel in 6 lots a freehold estate of 156 acres". It was described as well wooded. Other lots included The Squirrel pub and cottages and 15 and a further 12 acres of Priors Wood, described as "Building Estate".